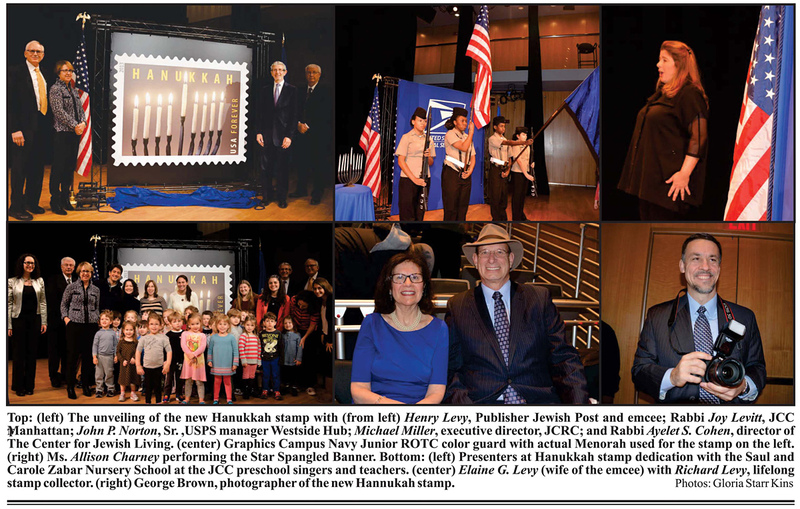 NEW YORK — On November 19, 2013 at the Jewish Community Center, 334 Amsterdam Avenue in Manhattan, the postal service unveiled the beautiful Hanukkah Lights stamps. The stamps arrive in time for the holidays to help send warm wishes in remembrance of this special holiday in keeping with the spirit of the season. Henry Levy, Editor & Publisher of the Jewish Post, was selected by the USPS to preside as the Master of Ceremony for the national dedication of the Hanukkah stamp. The Graphics Campus Navy Junior ROTC presented the colors. Superbly talented opera singer, Allison Charney, performed the Star Spangled Banner. Allison is also the creator and curator of the JCC's Performance series. The first speaker was Rabbi Joy Levitt, executive director of the host venue, the JCC in Manhattan. Prior to coming to the Center, Rabbi Levitt served for twenty years as a congregational rabbi on Long Island and New Jersey. She is the founder of the Jewish Journey Project, an initiative designed to revolutionize Jewish education for children. Rabbi Ayelet S. Cohen, director of the Center for Jewish Living and the Sonabend Center for Israel at the JCC also said a few well chosen words. Rabbi Cohen, a writer and activist, served for a decade at Congregation Beit Simchat Torah, the world's largest synagogue for people of all sexual orientations and gender identities. She is also co-editor of Siddur B'chol Levavcha. Michael Miller, executive director of the Jewish Community Relations Council, the umbrella group for about 50 Jewish organizations in New York, provided a wonderful account of the Hanukkah holiday, so fitting for the occasion. John P. Norton was the dedicating official. John is currently the Postal Service's manager of Customer Service Operations, Westside Hub responsible for deliveries to over 860,000 addresses in NYC and has become the most knowledgeable area manager in Manhattan. While Steven Bronstein who created the Menorah seen on the new stamp was not available, the photographer of this beautiful stamp, George Brown, was in attendance, taking photographs. A common thread connected most presenters, as they , or family members collected stamps. Mr. Levy recalled that some of his fondest memories were sitting with his dad looking at these colorful and marvelous stamps from around the world, with a special fondness for United States postage. He said, "Philately, is a wonderful way to teach a child about geography, about history, and today we also combine culture and heritage to the mix." After the unveiling of the Hanukkah stamp, those attending were treated to a musical selection off Hanukkah songs by the delightful students from the Saul and Carole Zabar Nursery School at the JCC. Evelyn Fleming, National Events Coordinator of the US Postal Service, deserves special recognition for flawlessly putting the entire event together. Ms. Fleming is responsible for launching about thirty new postage issues each year across the country. The stamps, official First Day Covers and other Hanukkah memorabilia were on display and for sale at the unveiling ceremony. The stamps will also be available for purchase at post offices nationwide, by calling USPS Stamps at 800-STAMP-24 or online at The Postal Store, www.usps/stamps. The stamp art is a photograph of a contemporary forged-iron Hanukiah created by Vermont blacksmith Steven Bronstein. Nine lighted white beeswax candles top each of the branches. The word “Hanukkah” is spelled out across the top of the stamp in yellow letters. Art director Ethel Kessler designed the stamp. George E. Brown was the photographer. The Hanukkah stamps are being issued as Forever® stamps. Forever stamps are always equal in value to the current First-Class Mail® one-ounce rate. Background: Celebrated by Jews around the world, Hanukkah, the joyous Festival of Lights, spans eight nights and days of remembrance and ritual. Observance begins this year on the 25th of Kislev in the Hebrew calendar, a date that falls in late November or December. In 2013, Hanukkah begins at sundown on November 27. Central to the celebration is the Hanukiah, a nine-branched menorah used only at Hanukkah. Eight of its branches represent each of the eight nights and days of Hanukkah, and the ninth, the Shamash or “the servant,” is used to light the other candles. Hanukkah is the Hebrew word for “dedication.” Tradition relates how a miracle took place during the rededication of the Temple in Jerusalem , which had been desecrated. The sacramental oil, thought to be enough for only one day, burned for eight days. The miracle of the oil is at the heart of the ritual of the lighting of the Hanukiah.